We sell and install only the finest outdoor lighting fixtures. 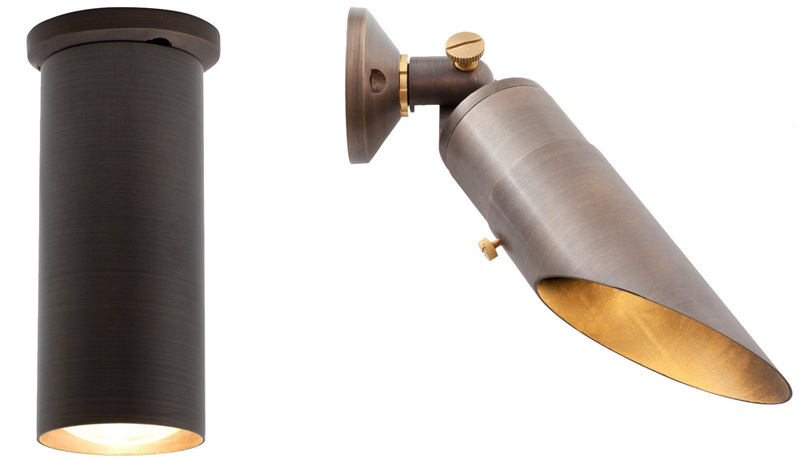 Our fixtures are solid brass and have a lifetime warranty on the fixture and lamps. If we install our solid brass lighting fixtures at your property you’ll never have to purchase another fixture again. Our outdoor LED spotlights come in three sizes, 3-watt, 6-watt and 9-watt. All three LED spotlights are true professional grade fully integrated LED fixtures. They are perfect for uplighting trees, houses etc. They are heavy solid cast brass construction and carry a lifetime warranty. All fixtures have premium internal components, the latest in LED technology, and are completely sealed. 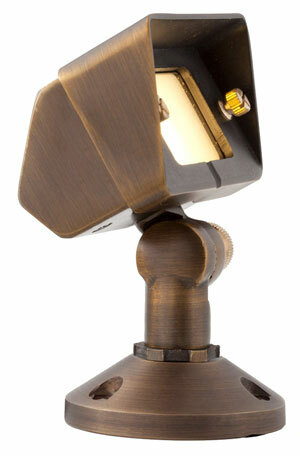 Our solid brass flood lights are the heaviest, best built, and most refined fixture we have ever sold. Truly impressive quality. 3000k soft white color temperature. ~ 80% ENERGY SAVINGS over halogen. The glass lens sits higher than the fixture so that water cannot puddle on the lens or collect at the seam. 3-Watt LED Up-Light Fixture. Click image to enlarge. Equivalent to 20W halogen lamp, 280 lumens. 36 degree beam angle. Soft, diffused edges for smooth even lighting. 6-Watt LED Up-Light Fixture. Click image to enlarge. Equivalent to 35W halogen lamp, 524 lumens. 60+ degree beam angle, wide flood. Soft, diffused edges for smooth even lighting. 9-Watt LED Up-Light Fixture. Click image to enlarge. Equivalent to 50W halogen lamp, 640 lumens. 2-Watt Wash Light. Click to enlarge. Equivalent to 15W halogen lamp, 135 lumens. Wide flood. Soft, diffused edges for smooth even lighting. Bullet up-lamp with stake. Click image to enlarge. Our bullet style outdoor lighting fixtures are low-voltage outdoor light fixtures that are truly rock solid! The body is thick solid cast brass construction. Tough enough to handle the weight of a full sized truck. This fixture is built with premium components: beryllium copper socket, convex lens (water will not collect on fixture), silicone seals and gaskets insure longevity. Perfect for any up-lighting application. Comes in 3 or 5 watt LED configuration. Beryllium copper socket – more corrosion resistant than copper. Clear lens for increased photometric results. Abulous Brass Path Light. Click image to enlarge. Our solid brass path light is a high quality path/area outdoor lighting fixture that will provide years of worry-free service. This fixture features a large 16’ lighting diameter which means you’ll save money by reducing the amount of area lights needed for your application. Large hat with a shallow angle and a tall stem brings this fixture out at 2’, allowing better photometrics. This fixture is solid cast brass construction with professional grade internal components and a lifetime warranty. 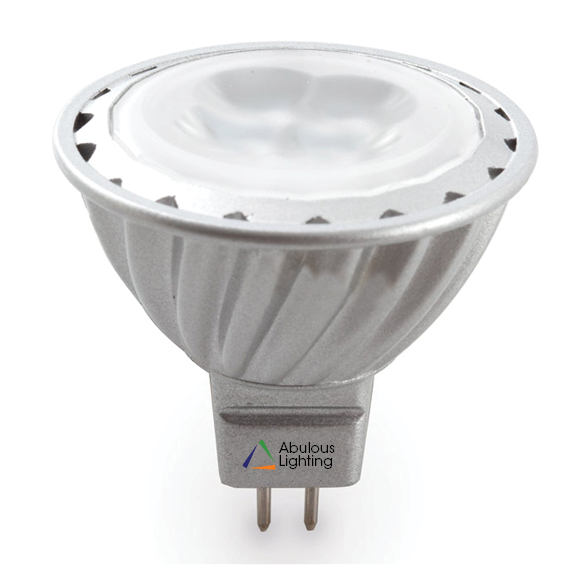 We use Bi-Pin LED bulbs that are 80% more efficient than a halogen lamp AND lasts 8-10 times longer. This fixture is energy saving, less maintenance, and equivalent to a halogen in brightness and color—all while being green and utilizing the latest in LED technology. Solid brass down lights comes with your choice of diagonal or full glare guard. Click image to enlarge. 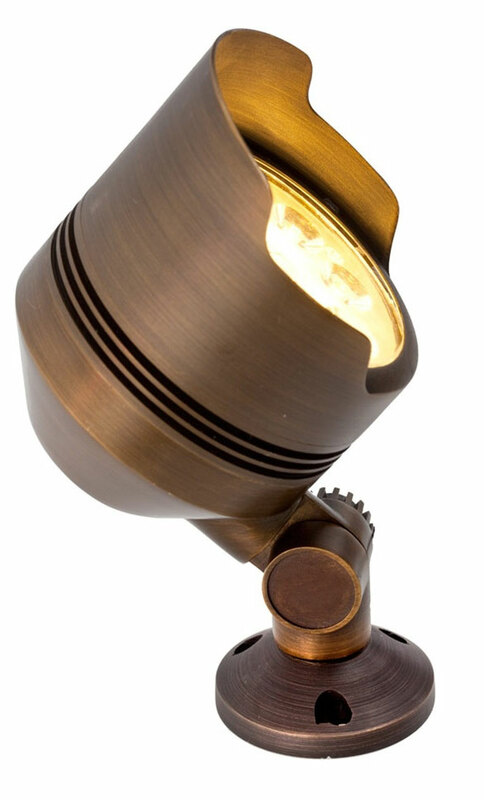 Our solid brass down light is a high quality outdoor lighting fixture that is specifically designed to be mounted upside down. This fixture has a silicone sealed knuckle to prevent water from entering the fixture. The lens has a small hole to let condensation escape when the fixture is mounted upside down. Comes with various beam angle bulbs. Comes with flush cut or diagonal cut glare guard. Will also accomodate halogen MR-16 bulbs. Solid Brass surface mount included. 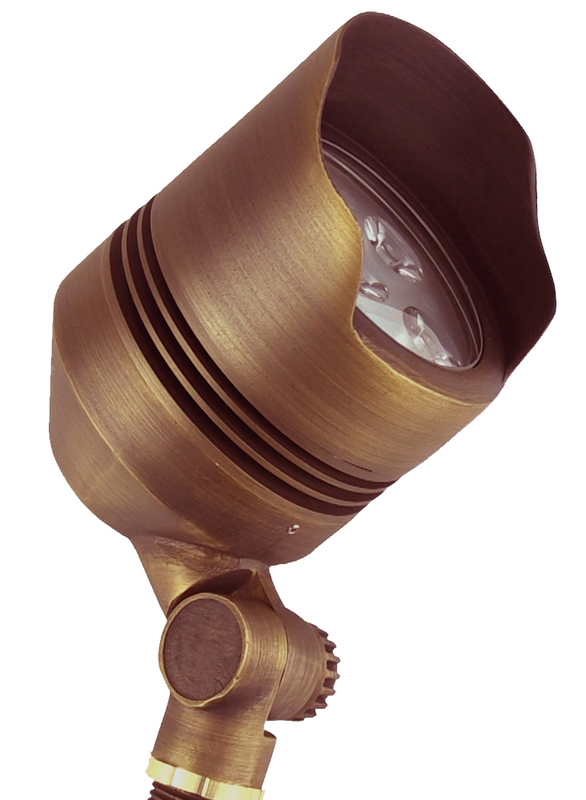 Solid brass LED deck light. Click image to enlarge. The Deck Light is a high quality low voltage outdoor lighting deck fixture. Sealed solid brass fixture means it’s perfect for post lighting on that pier or dock, as well as your decking and other hardscaping. Professional quality internal components make for a fixture that will last a long time, even through harsh outdoor elements. Pre-aged bronze finish. There is no powder coating, paint or finish to wear off or peel—just the natural patina beauty of raw copper that does not corrode. Made to fit where other deck lights may not. Ceramic white interior reflects light to maximize output and beam spread. Solid brass LED under deck light. Click image to enlarge. This low voltage light is best used in areas that require a light fixture that illuminates downward. Example applications include railing, retaining walls, counter tops (for outdoor kitchens) and even property walls/fences. Constructed of high quality solid cast brass with premium internal components. Fixture is completely sealed using sealants. The frosted lens casts off a beautiful even soft light that compliments any application. Natural brass finish, no paint or powder coating. Just the natural beauty of patina brass. Uses Bi-Pin lamp. Rated for up 20w. Protective brass tube to protect lead wire from crushing when installing on stone, concrete, or masonry walls. Pre-greased Beryllium copper sockets for additional protection from moisture. 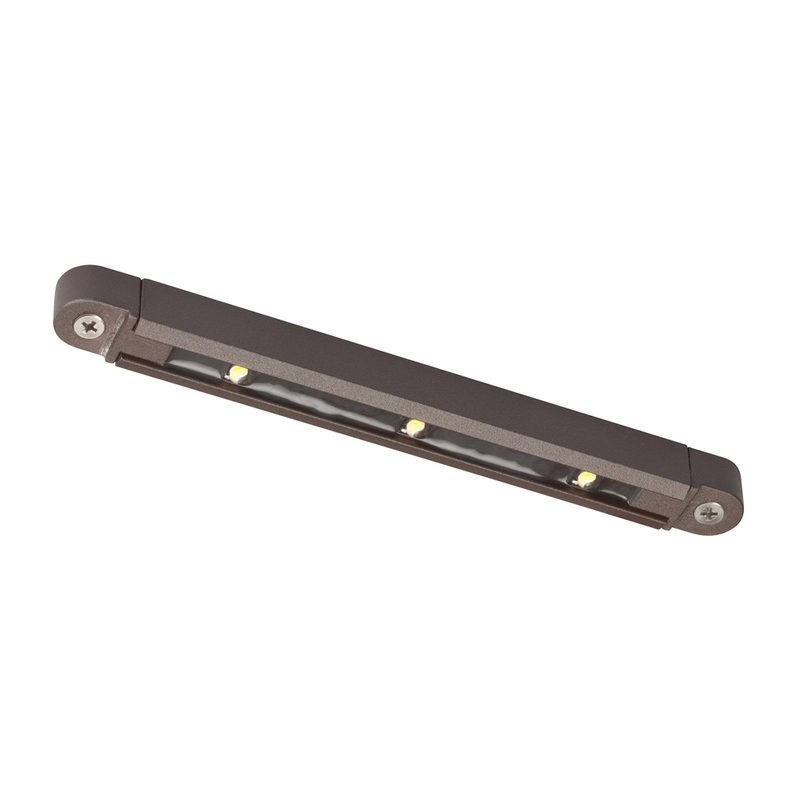 Abulous Low Profile LED Under Rail Fixture. Click image to enlarge. This low voltage light is best used in areas that require a low profile light fixture that illuminates downward. Example applications include railing, retaining walls, counter tops (for outdoor kitchens) and even property walls/fences. 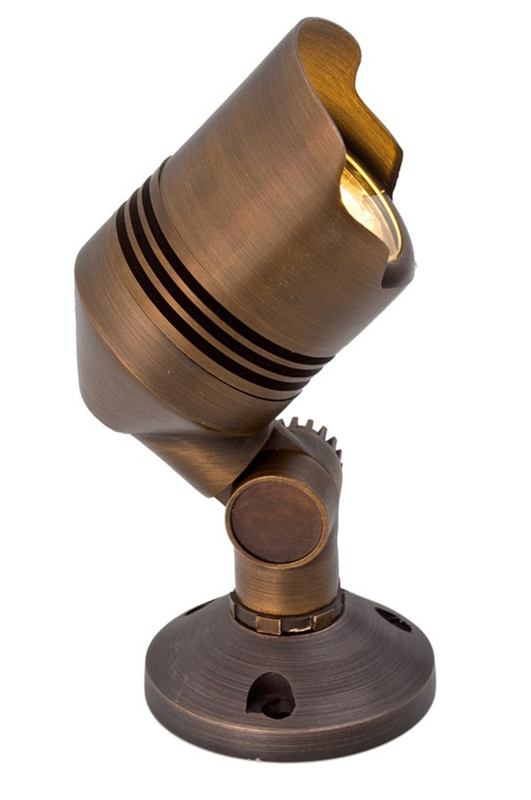 Constructed of high quality solid cast brass with premium internal components. Fixture is completely sealed using sealants. The frosted lens casts off a beautiful even soft light that compliments any application. Also available in 1, 6 and 9 LED models. Three Kelvin options available: warm white 2700k, pure white 3000K and cool white 4200K. Six finish options available: Textured Architectural Bronze, Bronzed Brass, Copper, Gray, Sand and Textured White. Abulous step light. Click image to enlarge. 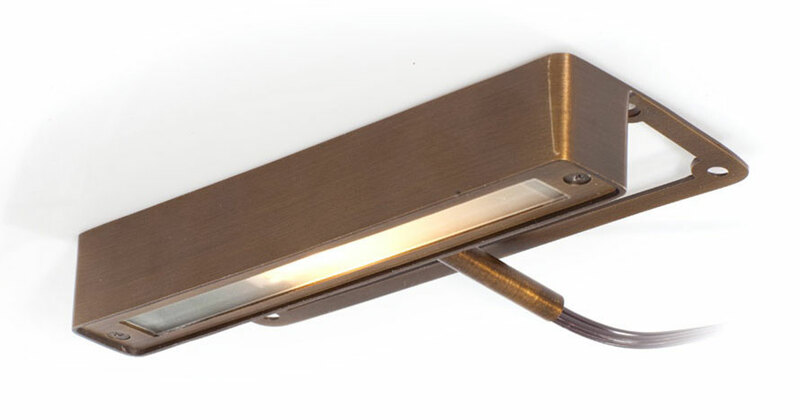 Our louvered outdoor LED step light is a fixture that is truly unique. Designed for LED and rated for in-grade concrete pour applications, this fixture utilizes a solid cast brass body—-including the the back canister. Most of the other outdoor lighting fixtures are folded sheet metal box which ultimately results in water leakage. Our louvered outdoor light is completely sealed and water tight. 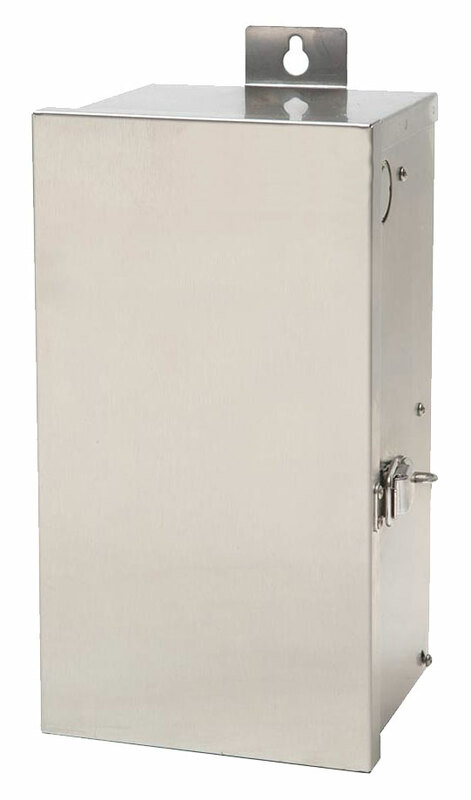 Featuring a rubber seal around wire exit, pressure fit rubber gaskets under the faceplate, and quality grade tinned coated copper lead wire. This fixture has professional grade internal components and lifetime warranty. We outfit this fixture with a LED Bi-Pin lamp that is 80% more efficient than a halogen lamp AND lasts 8-10 times longer. Energy savings and less maintenance—all while being green and utilizing the latest technology. Water tight—pressure rubber gasket, rubber seal around wire exit. Silicon plug where lead wires exit fixture. Prevents ground moisture and insects from entering fixture. Lens is flush with fixture so water cannot puddle. Frosted lens for smoother photometric results. Discrete Down Light. Click to enlarge. This down-light is an extremely compact solid brass fixture ideal for niche applications. It consists of a round brass disc (1.5” x 0.625”) with a Cree® LED embedded in waterproof epoxy. This low voltage outdoor down light can be mounted under benches, shelves, eaves, gazebos, arbors, porch ceilings, and any location that requires a small discreet light source. With an estimated life of 40,000 hrs. 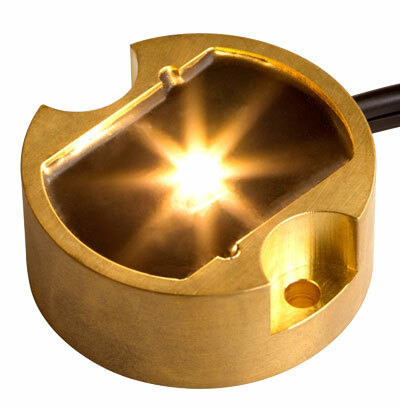 and an extremely low energy consumption (1.5W), this solid brass LED light is an energy-efficient lighting powerhouse in a very small package. Lifetime warranty. The Abulous Landscape Lighting Transformers are two-coil magnetic transformers that feature top of line internal and external components for professional results and commercial reliability. Our transformers feature a quiet toroidal magnetic core that can easily last for 20+ years. The toroidal core transformer also runs 10-20°C cooler than your conventional laminated magnetic transformers, its approved for indoor mounting! 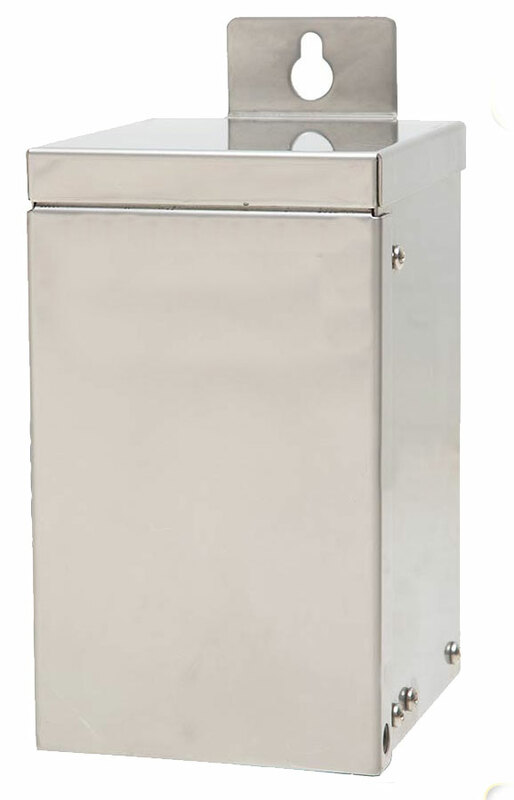 The solid stainless steel body further ensures the longevity of this transformer as well as a rust deterrent. 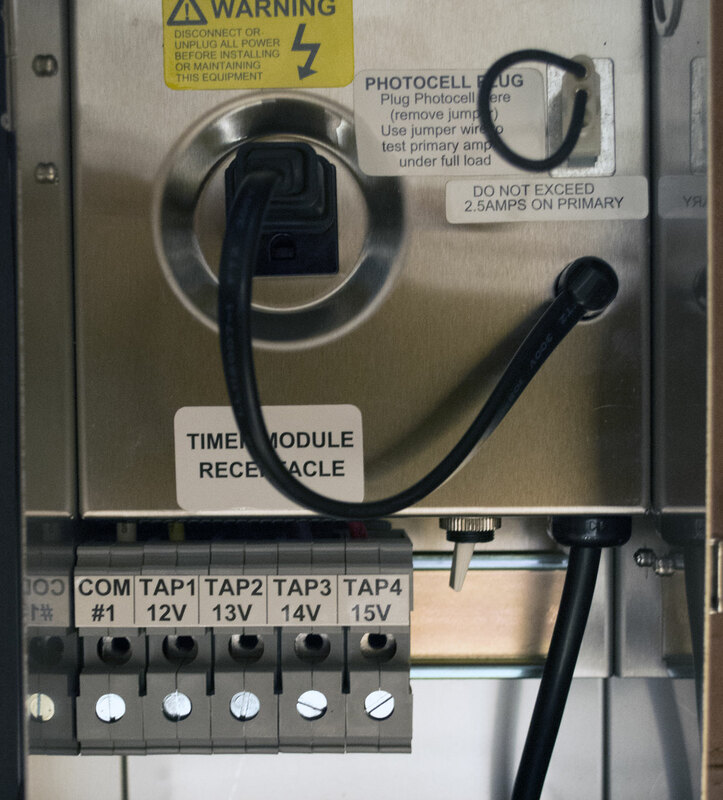 The optional photocell receptacle allow your transformer to be fully programmed to daylight scheduling. Our transformers best low voltage transformers on the market. They are ETL listed and carry lifetime warranty on the core and housing and a 5-year warranty on other electrical components. Abulous 75-watt transformer. Click image to enlarge. Abulous 300-watt transformer. Click image to enlarge. 300-Watt Transformer interior view. Click to enlarge. When combined exclusively with our LED fixtures this transformer has the power and capability to power a complete home system including front and back yards. 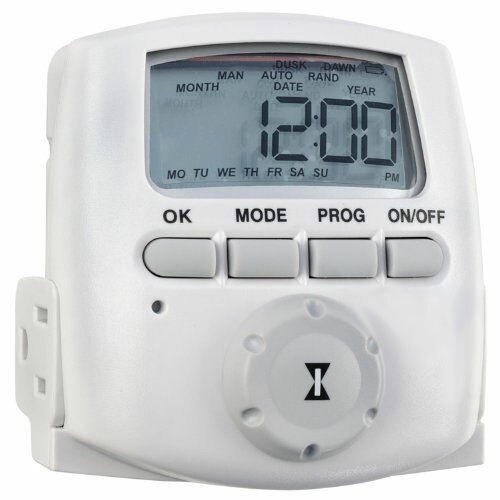 Adding a digital astronomic timer will ensure a completely worry-free, maintenance-free system for years to come. This transformer will also accommodate an optional photo cell for automatic dusk-to-dawn operation. Astronomic Digital Timer. Click to enlarge. You will never have to adjust this timer. We program the unit to your specifications prior to installation. The battery back-up means you’ll never have to reset the time after a power outage. Not only does it have built in sunrise/sunset tables but it also adjusts for Daylight Savings time. Eliminates the need for a photocell. Comes pre-programmed for sunset to sunrise operation. Our replacement bulbs use 80% less energy and last 40 times longer than halogen bulbs. They are the perfect choice for replacing old incandescent halogen bulbs. They come in a variety of wattages and beam angles. Our bulbs require zero maintenance and will likely be the last bulb you buy for your fixture. They are designed for indoor or outdoor use. Abulous MR-16 LED replacement bulb. Click to enlarge. Available in 2 to 10 watt. Comparable to halogen 10 to 50 watt. Beam Angles from 12° to 60°. Color temperature is 2700k (warm white). Pricing varies by wattage and beam angle.